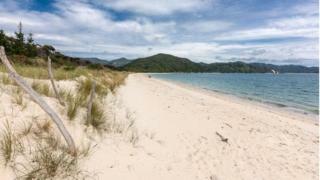 A crowdfunding campaign to buy a New Zealand beach has had its bid accepted after reaching its funding target. Nearly 40,000 people donated almost NZ$2.3m (£1m, $1.5m) to buy the Awaroa beach in the Abel Tasman National Park, on the north coast of South Island, which went on sale last year. Campaigners said the government and another major donor also contributed. The project was launched after a group of friends vowed to secure the beach for public use. The current owner - businessman Michael Spackman - agreed to sell them the beach following four days of negotiations after the crowdfunding campaign reached its target in just over three weeks, local website Stuff reported. "We've been through the wringer to get it and that's a shared experience that forms friendships," campaigner Duane Major told supporters. "Now we hope people have shared experiences of this beautiful piece of pristine serene NZ beach and bush." New Zealand's Conservation Minister Maggie Barry said the government had made a modest but vital contribution towards the purchase, Stuff reported. Ms Barry said she hoped the project would set a precedent for future projects. But another offer to contribute by a businessman and philanthropist, who said he would make up any shortfall in exchange for exclusive access to part of the beach for his family, was rejected. The campaign also negotiated with local Maori groups, who argued the beach should be handed over to them. The land - marketed as "a remarkable seven-hectare utopia" - will now be included in a state-managed national park along with other bits of land bought by the government, Ms Barry said. Mr Major admitted the seven-hectare beach, which also offers access by air via a nearby air strip, was not that easy to get to, but said that in the future "hard to get to places are going to be harder to find". He said the decision to launch the campaign had been a matter of "gut instinct". "The land we share is the ground we stand on and it's very closely linked to our identity," he said.